For many living on Salt Lake City’s west side, a few essentials that many enjoy can be just out of reach. Things like quick trips to the store can be tricky if you don’t have a car. Transportation can be one of the greatest hindrances in helping families enjoy healthy meals if there isn’t a grocery store within close walking distance to a home, and some are forced to compromise the health of their families by grabbing quick food fixes at gas stations or fast-food joints because they are nearby and cheap. Those two brown bananas and that crusty-looking apple at your local five-and-dime could be the best selection for some families. 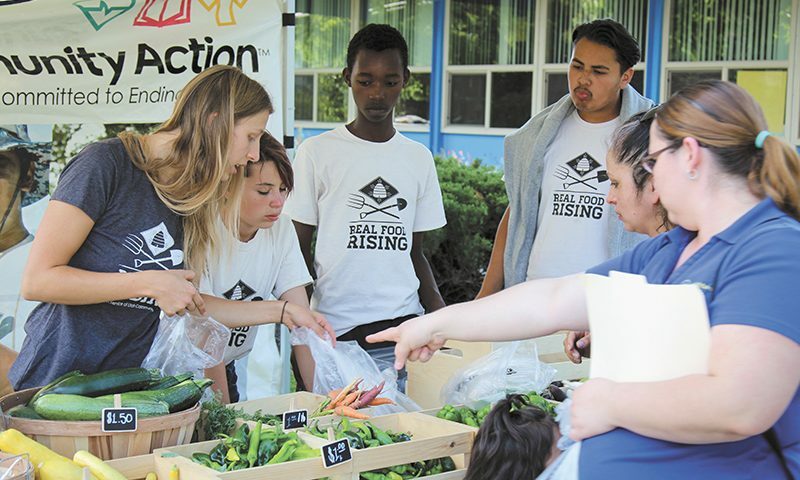 With the support of a USDA grant, SLCgreen has teamed up with The Green Urban Lunch Box, Utahns Against Hunger and Salt Lake Community Action Program’s Real Food Rising to establish Urban Greens Market, five pop-up markets that provide fresh and local produce within walking distance to community members. I spent an afternoon hanging out at the Neighborhood House pop-up market with a crew of farm-wise teens and a few neighborhood chickens ogling a beautiful selection of freshly grown peppers, a variety of tomatoes, zucchini, squash and other early-harvest goods. 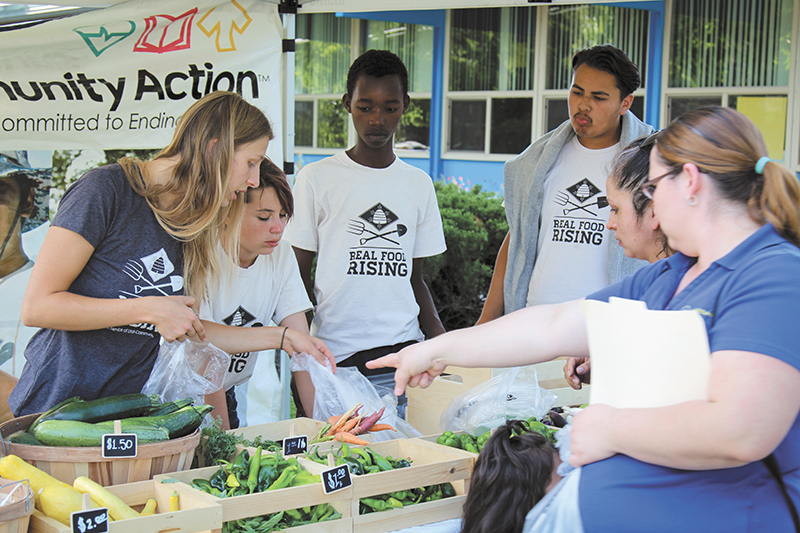 The majority of the produce sold at the markets is locally grown, and much comes from Real Food Rising’s large community garden located next to the Neighborhood House pop-up market. Green Urban Lunch Box also provides fruit for the markets. Simmons mentioned that teens are also getting experience and training in several job-related skills through the work they do growing and selling produce. “They do workshops and learn about public speaking, working as a team and helping the community,” she says. Lilly chimed in again to mention writing resumes, learning how to interview for jobs and participating in a guided communication exercise called Real Talk, in which staff and teens can give each other feedback on what they are doing well or what they can work on. Moving forward, Stuchly hopes to see the program continue to grow and better meet the food needs of the community. “We hope that the Urban Greens Market will be a success and that we will be able to expand the program to other areas of the city for urban agriculture so we can grow more food—food [that] is affordable and healthy,” she says. Urban Greens Market manifests as stands in various locations around Glendale and Poplar Grove throughout the week and will be open through Nov. 14. You can find hours of operation and additional info about the markets at slcgreen.com, or you can text MARKET to 51555 to receive updates on available produce and more. Be sure to catch Green Urban Lunch Box’s 35-foot school bus/greenhouse/mobile farmers market at the Urban Greens Market pop-ups that they oversee.